The U.S. 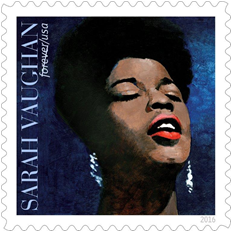 Postal Service today dedicated a Forever Stamp honoring Sarah Vaughan, one of America’s greatest singers. The ceremony was held in her hometown at the Sarah Vaughan Concert Hall at Newark Symphony Hall. The stamp is the seventh in the Postal Service’s Music Icons series, which includes Lydia Mendoza, Ray Charles, Johnny Cash, Jimi Hendrix, Janis Joplin and Elvis Presley. Vaughan fans are asked to share this news using the hashtags #Musicicons and #SarahVaughanForever. “As one of the most compelling vocalists in American history, Sarah Vaughan was renowned for her artistic eloquence. Her dynamic vocal range, iconic vibrato, and innovative phrasing helped to transform jazz and popular music,” said Deputy Postmaster General Ronald Stroman, who dedicated the stamp. The Blair Partnership, J.K. Rowling’s literary and brand management agency, has announced the launch of a publishing program of new print and digital titles from J.K. Rowling’s Wizarding World. The new program will debut at 12:01 a.m. on July 31, 2016 with the publication of a “special rehearsal edition” of the script book of the stage play Harry Potter and the Cursed Child Parts I & II, which begins its run at London’s Palace Theatre this summer. This new hardcover print version of the play will be released in the U.S. and Canada under Scholastic’s Arthur A. Levine Books imprint and will retail for $29.99 in the U.S. and $39.99 in Canada. As a response to Google’s announced ad policy change for publishers on April 26, created in accordance with the European Union’s General Data Protection Regulation (GDPR) that goes into effect May 25, four publishing trade groups released a letter addressed to Sundar Pichai, Google CEO, that criticizes the demands placed on publishers as well as the lack of information provided by the company in their policy change. Top executives from Digital Content Next, European Publishers Council, News Media Alliance and News Media Association, representing publishers like Hearst, Conde Nast and National Geographic, expressed the concerns they share about the regulations placed on publishers who wish to continue using Google’s advertising services in the European Union. The three areas highlighted in the letter that pose the most concern and create uncertainty for the trade groups are Google’s Controller Terms, responsibility of obtaining legal consent, and the complete placement of liability of said consent on the publisher and not on Google. Click Read More below for additional information.